Korhal Compound TE takes the ladder edition of Korhal Compound and applies updates based on tournament standards and today's metagame. Changes include adding neutral supply depots to the main ramps, moving the third expansions out of siege tank range, and reducing the amount of chokes placed throughout the map. For a full list of changes from the original version, see below. Published on NA and EU. Looks great. Any hope for this version on ladder? It seems ridiculous that Blizzard wouldn't consider any updates provided, especially since the original map was made a while ago and it was a pretty long time before they even added to the ladder. But I thought I recalled you say that they wouldn't accept an update from you? Btw, the change log says both that the natural choke size has been reduced and that it has stayed the same. Whats that? You want the third farther, tankable bases, and rocks? In all honesty though, I would probably not veto Korhal if it were this version on ladder Great job! This version was actually sent to Blizzard, but they turned it down for this season because the current LE version isn't showing enough imbalance to justify any changes. Imo there is enough wrong with it that I'd like to change for tournaments, so I/ESV released a tournament edition. The best thing is to just show your support for the map in tournaments, and maybe Blizzard will pick it up if tournaments do. But in general, there isn't a whole lot that can be done about changing the LE version soon. Thank you! The funny thing is that the LE version was made about 8 months ago, so it was really behind the metagame when it was implemented in ladder. I intend this version to bring it to the standards today. Glad you like it! I still hate the center of this map with a passion, but the changes to the thirds look promising. I think part of me hating the map is I'm not using the moveout paths properly/with the correct number of units. Seriously can you people not learn how to implement an image to your posts? there is an upload image feature on teamliquid that scales the image down and makes it clickable.. use it. Since i presume you have gotten warnings in your message box about this issue because I did the first time I posted an image that was too big. 132x132 to 132x136 can somebody show how much of a difference this makes. Can the mutas hide in the corners now? Now if only we could get blizzard to use these versions of the maps instead of their 'foe' tournament maps where they muck with them. I was a little bit dissapointed in the old version. I loved the layout and have always considered it a worthy top finisher of TLMC. Unfortunately I have it downvoted on ladder now since I as a (mediocre) zerg player cannot deal with ZvT on it. I love the changes to TE though and the map really deserves a second chance. Very nice changes, I wish that Blizzard will one day implement this into the ladder version. TE has a good ring to it !_!. I like Korhal Compound in the current map pool but I don't really get the changes you made to the map. The problem with the third is not that it's attackable from the cliff but that you have to come out in the open to defend the front entrance. This is a big problem in PvZ and TvZ (especially with mech). Sieging the third is not something that should really work early on in the current meta game. Making the natural easier to defend is a good decision though. I want to be with those who share secret things or else alone. If you noticed I also shrunk the "open space" you referred to defend the third. I also added rocks to make it even more choked (but allow Zerg to open it up at their third). Fixing the siege range was a change I decided to do because there are very few maps that you can siege the third on currently. It was also a major point of qq from players. Lets play on this some time monitor :D Looking forward to it. Decent changes - to bad it will take at least another season till Blizz reacts (or ultimately just removes the map from the pool -_-). Wish they took these changes for season 7 - that third looks so much nicer, as does the rest of the map. Grats! 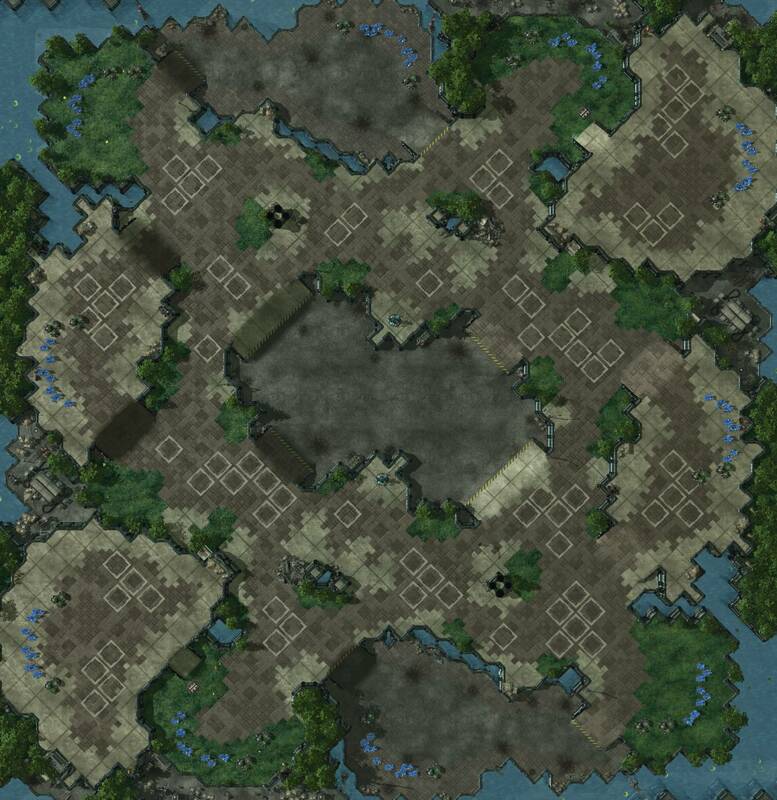 as a terran player I've had this map vetoed forever because of this (even with the siege tank range thing) and would probably leave it vetoed. That said, a step in the right direction. Have you considered raising the 3rd to high ground? This would remove a lot of the feeling that the 4th is just as easy to take as the 3rd as well as making the 3rd a bit easier to defend from counterattacks as others were complaining about.